"Hotter than fish grease in the summertime, prettier than a flower in a flower shop." In recent years, Little Richard, that icon of 1950s rock and roll who flirted with the line for so long, swerved firmly over it and into self-parody. Now that he's a fixture on things like The Hollywood Squares, it's hard to think of him as a musical revolutionary, much less an agent of social change. This official biography of his early years, produced originally for television, doesn't offer anything revelatory, but at least it's an opportunity to hear some great tunes again, and to revisit young Richard Penniman's origins, in a safe, Hollywood kind of way. Much of this effort is familiar, and while the right notes get struck, there just isn't much rhythm to them. There's Richard's conflicted relationship with his father, who doesn't much care for his son's singing and dressing up like a woman ("There's no way I'm raising some sissy-boy clown"), climaxing in the father sending young Richard, in drag, into a boxing ring, where he's promptly beat up—the father carries home his son in a dress, in what seems like a bizarre, unintentional parody of a pietà. (Haven't you tired of show business bios about stars whose mommies and daddies didn't love them enough? I sure have.) Richard struggles with the devil in his soul—representing the light is the local preacher, played by Saturday Night Live alum Garrett Morris—but since there's more than a little of the devil in him, he goes on to some small success playing vaudeville, and then on up the ladder of show business, climaxing with his buying his mother a great big pink house in Los Angeles, right next door to Joe Louis. The story gets told in an adequate manner, but it doesn't have much zest to it—it's lacking all the attributes that made Little Richard such a supernova of a performer in the 1950s. Part of that is due, no doubt, to the limits of the form—there's only so much you can do with a movie of the week. And so more intriguing subject matter—intimations of homosexuality, for instance, or how much Richard likes to watch—are talked around, at best, and never dealt with straight on. (Little Richard himself has an executive producer credit on this project, so no doubt this is the authorized, sanitized version of his life.) Another big problem is that in some respects this is well-covered movie territory, and it's hard as you're watching not to compare this effort unfavorably to pictures like What's Love Got To Do With It?, La Bamba, The Buddy Holly Story, even Great Balls of Fire. There are a couple of things working in the movie's favor, though, the first of which unquestionably is the music. Even all these years later, Richard's first huge hit, Tutti Frutti, still packs a wallop—one of the film's best moments is when he tears into it in the recording studio, impressing a previously dubious backup musician, played by rapper Warren G. Leon does good work as Richard—it's not an impersonation, thankfully, but he seems to have found the spirit of the man, and though Little Richard's fame can't be disputed, Leon doesn't have the thankless task here that Will Smith did in Ali, of portraying a man whose face and voice were absolutely everywhere. And occasionally Robert Townsend's direction rises above the pedestrian. The best sequence is probably the cross-cutting between Richard recording Long Tall Sally and the hopelessly white Pat Boone cutting the same song; Boone's cover is slower, less driving, less rhythmic—it's more, well, it's more white, which at the time may have been the only version of the song palatable enough for white record buyers. Overall, this project all seems a little pat, and the narrative ends rather abruptly and arbitrarily in the early 1960s, not because the whole story has been told, it seems, but rather because it's time for the local news. 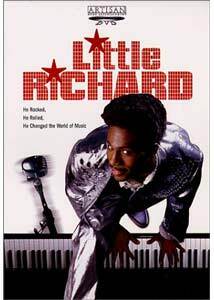 This movie doesn't give us a world of information about the man, his music or his times, and doesn't really get us inside Little Richard's head. But oh, my, that fellow can sing. I don't know the facts of his life well enough to say that he deserves better, but what's here is just not a terrifically compelling story. Image Transfer Review: Production values are high, considering that this was produced for television, but the transfer is a little too brassy and glossy for my taste�reds and greens look overly saturated, while browns and blacks are murky and muddy. There's little debris or interference, which is a plus, and obviously the project was conceived for the small screen, but its palette does seem a little garish. Audio Transfer Review: Little Richard's music sounds great, as if the original recordings were spruced up for this project; generally the dialogue tracks are clear, though acoustically there are problems with the scenes shot on a larger scale. The mix just doesn't seem to get it right when we're listening to, say, a conversation in the wings while Richard performs on stage. Extras Review: Nothing but chapter stops in the extras department. Also, the copy on the back of the DVD case may make you wonder if its author has seen the movie; the film ends in 1962, with Richard born again, but the case refers to the "drug and alcohol addiction [that] plagued his career in the late 60's," which are nowhere to be seen in the feature. Similarly, the case lists the running time as 120 minutes, but that would be with commercials; the film itself runs less than an hour and a half. A competent if uninspired television biopic, you'll probably have more fun cranking up the stereo with a Little Richard greatest hits CD than watching this movie. What's here is pretty tame, but his music still has the power to get you going�or, as the man himself would say: A whop bop a loo bop, a whop bam boom.